Russian Prime Minister Dmitry Medvedev speaks at the 2016 St. Petersburg International Legal Forum in St. Petersburg, Russia, May 18, 2016. Dmitry Medvedev, Russia’s prime minister, urged the international community to act together to address global security challenges, some emanating from the internet. Russian Prime Minister Dmitry Medvedev has emphasized the importance of international cooperation to address new global challenges, including regulation of the internet, while admitting that Russia has been feeling the pressure of Western sanctions. 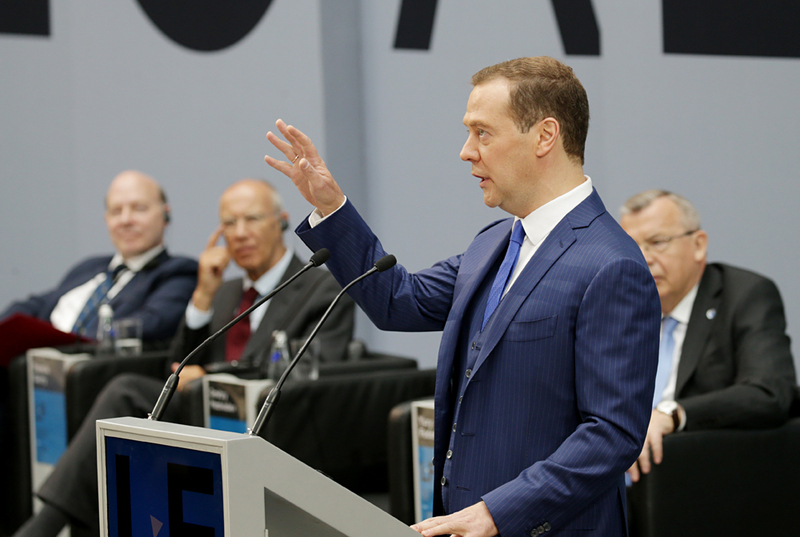 "Our companies and citizens have been subjected to pressure for two years," said Medvedev, head of the Russian government, at the plenary session of the St. Petersburg International Legal Forum on May 18. The Russian prime minister said the main focus of work for the cabinet in the field of law should be resolution of international disputes, protection of intellectual property and expansion of laws for new sectors, including the cyber world. Stephen Crown, vice president of Microsoft, who was also present at the forum, said regulation of the cloud computing sphere is currently the most pressing issue. "Russia is ready to prove the core values of our civilization, but we can achieve this goal only together," said Medvedev. "We must trust each other in solving global problems of the state." He said, however, that the role of unilateral restrictions, including sanctions, has recently increased. "Sanctions are becoming vague both in terms of their content and the circle of individuals [they concern]. Moreover, there are attempts to 'force' sanctions anywhere in the world in spite of all international agreements," he said. Medvedev said it was necessary to take all important economic and political decisions in a legal manner. Russian authorities were ready to comply with decisions of international courts. "Our system remains open to the enforcement of foreign arbitral awards, unless they are contrary to our public order," said Medvedev. However, he felt, some investors were using the "veil of a foreign jurisdiction" to have an effect on the Russian authorities. He did not elaborate upon which investors he meant. Miriam Naor, president of the Supreme Court of Israel; also present at the forum; said international co-operation, is necessary, at least, in the fight against terrorism. "Over the past few decades, terrorism has become a global threat that requires global solutions and responses," she said on May 19. The fight against terrorism, Naor said, involves restriction of some fundamental freedoms; though such restrictions must be justified and balanced. New laws needed to be developed to include the various new areas that threaten security, primarily the internet, Medvedev emphasized. "We live in the digital age, when it is very difficult to establish the identity of a counter-party in legal relations," he said. Legal instruments, he said, must comply with the new digital era, including the protection of intellectual property rights. The prime minister acknowledged that bans on the use of pirated content do not work in the modern world. Microsoft's Crown said regulation of the digital domain was inevitable, but it was important that it be limited. Development of cloud computing raises serious problems of information confidentiality, he said. Microsoft estimates that the world’s urban population will soon grow by 2 billion people. If this trend continues, it is necessary to think about how electricity will be used and how a variety of data storage services will work, said Crown. The Ministry of Communications recently published a new state programme, by which 99 per cent of Russian internet traffic should be transmitted internally by 2020. The internal digital infrastructure should be able to work autonomously. The ministry said security concerns had prompted the new initiative published on May 13.